Isopentenyl pyrophosphate (IPP, isopentenyl diphosphate, or IDP) is an isoprenoid precursor. 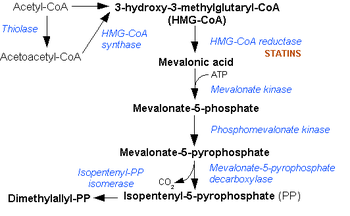 IPP is an intermediate in the classical, HMG-CoA reductase pathway (commonly called the mevalonate pathway) and in the non-mevalonate MEP pathway of isoprenoid precursor biosynthesis. Isoprenoid precursors such as IPP, and its isomer DMAPP, are used by organisms in the biosynthesis of terpenes and terpenoids. IPP is formed from acetyl-CoA via the mevalonate pathway (the "upstream" part), and then is isomerized to dimethylallyl pyrophosphate by the enzyme isopentenyl pyrophosphate isomerase. Simplified version of the steroid synthesis pathway with the intermediates isopentenyl pyrophosphate (IPP), dimethylallyl pyrophosphate (DMAPP), geranyl pyrophosphate (GPP) and squalene shown. Some intermediates are omitted. Please note the color scheme is for illustration only and does not correctly represent the origins of the isoprene units of GPP. IPP can be synthesised via an alternative non-mevalonate pathway of isoprenoid precursor biosynthesis, the MEP pathway, where it is formed from (E)-4-hydroxy-3-methyl-but-2-enyl pyrophosphate (HMB-PP) by the enzyme HMB-PP reductase (LytB, IspH). The MEP pathway is present in many bacteria, apicomplexan protozoa such as malaria parasites, and in the plastids of higher plants. ^ Banerjee, A.; Sharkey, T. D. (9 July 2014). "Methylerythritol 4-phosphate (MEP) pathway metabolic regulation". Natural Product Reports. 31 (8): 1043–1055. doi:10.1039/C3NP70124G. ^ Chang, Wei-chen; Song, Heng; Liu, Hung-wen; Liu, Pinghua (2013). "Current development in isoprenoid precursor biosynthesis and regulation". Current Opinion in Chemical Biology. 17 (4): 571–579. doi:10.1016/j.cbpa.2013.06.020. PMC 4068245. ^ Wiemer, AJ; Hsiao, CH; Wiemer, DF (2010). "Isoprenoid metabolism as a therapeutic target in gram-negative pathogens". Current Topics in Medicinal Chemistry. 10 (18): 1858–71. doi:10.2174/156802610793176602. PMID 20615187.